Leading global hotel chain and hospitality management group, Swiss-Belhotel International, was the proud recipient of four coveted Bali Tourism Awards, presented at the annual gala dinner held in August. Swiss-Belresort Watu Jimbar was named Bali's 'Leading Four-Star Non-Beach Resort and Swiss-Belhotel Tuban received the awards for Bali’s 'Leading Airport Hotel'. 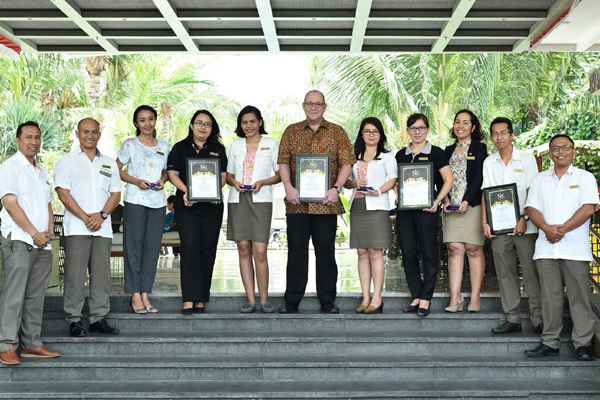 In addition, an individual award was given to Christopher MacLean who was named Bali 'Top Hospitality Leader' and Swiss-Belhotel International also received the Bali 'Leading Regional Operator' award in recognition of the brand’s continued success. In 2016, Swiss-Belresort Watu Jimbar scooped Bali’s lLeading New Resort' award, while Swiss-Belhotel Tuban was named Bali’s 'Leading Four-Star Hotel' at the Bali Tourism Awards, which made this year’s awards a double-win for both properties. "With over 52,000 votes cast online across seven countries this year, the Bali Tourism Awards validate travel brands that stand out in terms of performance, excellence, innovation, quality and creativity,” said Swiss-Belhotel International’s senior vice president of operations and development for Indonesia, Malaysia, Cambodia, Emmanuel Guillard. “To be recognised as part of Bali’s success once again with these awards is a great honour for Swiss-Belhotel International and a clear sign that our Passion and Professionalism fits well with the island’s fast-evolving tourism landscape,” he added.